Jais Nielsen was born on1885 in Copenhagen, Denmark. Born Johann Knud he took the “Jais,” this is the way he signed his works. He began his studies at Kristian Zahrtmann’s art school in 1899 and exhibited for the first time in the 1907 Autumn Salon in Copenhagen. He also participated in a group show with the “Group of Thirteen,” some of who had been students with him at the Zahrtmann School. Nielsen’s concentration on the human figure, and especially on movement, was unusual in Denmark at that time. His forms became increasingly simplified in the early years (1907-1911) and his vivid use of color, like the Fauvists, whose work he had only seen in reproductions, was a departure from the subdued coloration of nineteenth-century Danish painting. In 1911 Neilsen moved to Paris, he settled in the Latin Quarter near the Musée Cluny. Neilsen exhibited at the Salon d’Automne in Paris in 1912. Though Neilsen attended meetings at the Section d’Or, which met at Jacques Villon’s studio, he apparently remained relatively isolated from the other Cubist painters. At the outbreak of World War One Neilsen moved back to Copenhagan. The modern style he began in Paris stayed with him. 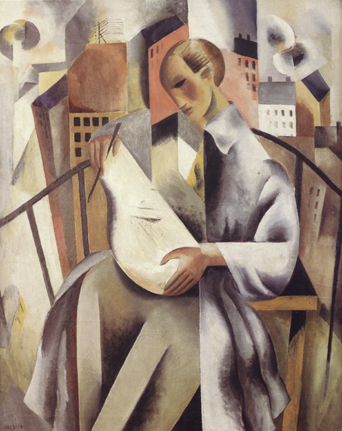 Sports, dance and the circus were themes that interested him greatly; he painted many canvases in the best tradition of the early Cubists, of which he was one. Neilsen was not well received by the critics in his own country, in 1920 he ceased to paint and concentrated on ceramics, he became world renown for his work the Royal Copenhagen porcelain company. Neilsen was the only Danish artist represented in the important Futurist exhibition, “Futurismo & Futurismi” in Venice, Italy in 1986. A retrospective was done of his work in 1986 at the Galerie 1900-2000. Neilsen’s works are in the Museum Lolland-Falsters in Maribo, Denmark, and National Museum of Oslo, Norway.